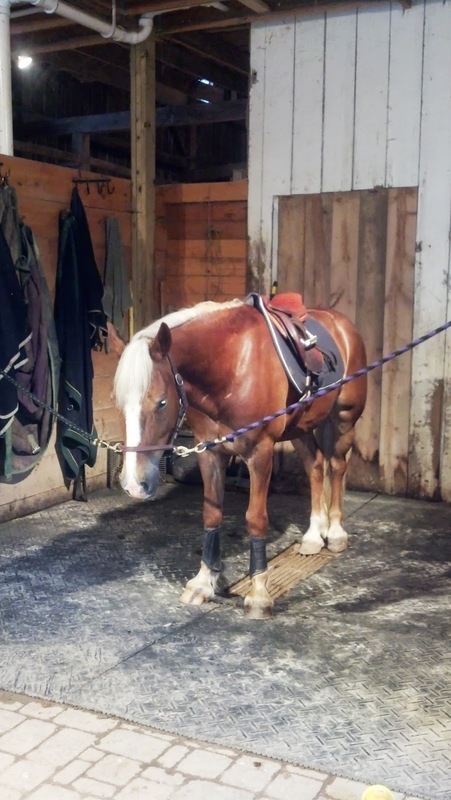 After three really tough, soul-searching rides (and, thank you karma, one of them was immediately after it took me 45 minutes to catch Connor, the day I put up that post) I was ready for my lesson today. I just needed some guidance and confirmation that what I had done was right. I got it in a big way when we had the best jump lesson ever, AND it was in the pouring rain because we have no jumps in the indoor in the summer. Rock on. 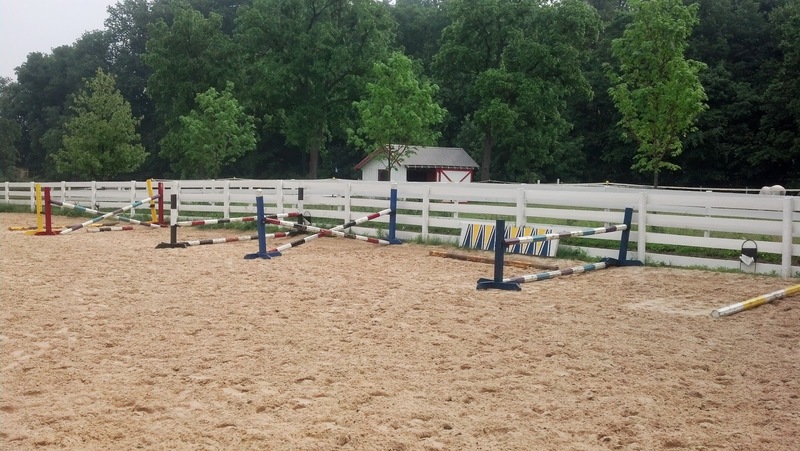 This was the exercise, which started out as all poles, had an oxer for the last element when we were going off the left rein, and had that vertical as the final element on the right rein. In my warmup, I did the square and little circle exercises to get him on my aids, off my hands and not blowing through my outside aids with his shoulder, and it paid off. He was between my leg and hand, adjustable, and gave me something to work with in the jump exercises. - She had me focus on keeping my heels deep and my core engaged so that when he put his nose down to look at the fences, or launched over the oxer (what is it with this horse and oxers!) I didn't get pulled down with him or fall forward. Eventually he won't put his nose down anymore, but for now, I have to deal with it gracefully. - She said it wasn't a gymnastic in which you just get him there, that I had to keep him active each time we landed and in between so that he didn't lose steam. When I did it right, he felt like he could've jumped a 4ft fence on the out fence. - I'm so bad about jumping ahead at times, I need to think in my head that I am leaning back and letting the reins slip through my fingers. - Speaking of height, I am pretty sure that vertical is the tallest fence we've ever jumped together, and I expected it to be a big effort from him, but I almost didn't even notice him jumping underneath me. He also didn't really put his nose down to it because, well, it was not that far below his nose. My trainer put it up a couple holes while we were in the opposite corner approaching and not looking, as usual - surprise! Not sure if she does this on purpose or not, but it's really effective. I was afraid of crossrails not that long ago, sometimes I still get nervous when I see the fence go up. - We did this over and over and over, which gave me a chance to fix things and really get comfortable over fences for the first time in a long time. - I noticed that the amount of core and leg engagement needed for a good jumping approach feels really similar to the amount needed for our baby collected gaits. After the lesson, we discussed our next move, which looks to be the Leg Up Horse Trials at the Hoosier Horse Park on June 29th. Just a local schooling HT, going Starter. "And this time," my trainer said, "You're good on the Dressage test and now you'll go double clear everywhere else!" As if there was any mystery that we've been in jumping boot camp since the last show! It's made a huge difference, and I am having a blast. Today was one of those days that makes the 45 minute catching session bearable. Love this little guy. Oh that looks like fun. I remember a jump lesson with Barry getting ready for a CT that took place in the rain. We won that so maybe the rain brings good luck. power napping must run in the family!